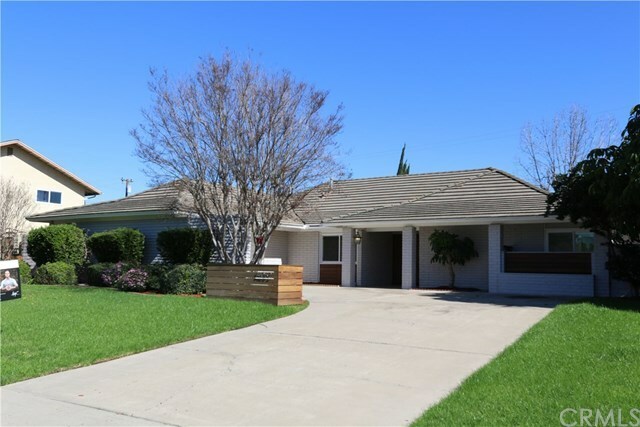 Stunning Single Story Mid-century Ranch Home * 12,500 SF Flat Lot * Cul-DeSac * Upgraded * Pool. This beautiful homeâs dramatic architecture with Smooth ceilings, abundant windows and Large sliding doors opening to picturesque rear grounds is both classic and contemporary. Impressively appointed, the bright and open approximately 2,290 square foot floor plan features 4BR and 2BA including the master suite bathroom. Among its other highlights are a grand living room with floor to ceiling stone flanked modern fireplace, a large formal dining room, open concept kitchen with large center island, granite countertops and spacious informal dining area that adjoins a family room with ample sitting areas. In addition, the home has an attached two car garage with roll up door. The picturesque lot is a wonderful extension of this fantastic property and ideal for outdoor entertaining with sprawling lawns for recreation, various alfresco concrete patios for dining outdoors, a built-in BBQ with bar counter and seating, plus a fabulous sparkling pool to be enjoyed throughout the year. Within the boundaries of outstanding Tustin schools and close to every convenience including excellent community shopping and dining.